These look super cool. Not as adorable as the Halloween designs, but still cute! I love the candy cane design. That's one I've tried so many times with Konad and freehand but I can never get it just right. 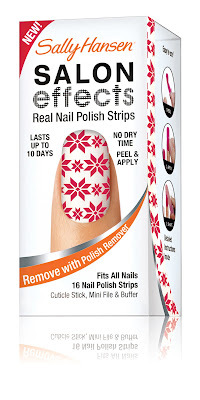 WHAT THEY ARE: Limited-edition holiday prints of Sally Hansen’s hit, Salon Effects Real Nail Polish Strips. When Sally Hansen first introduced its peel-and-apply nail polish strips, the manicure breakthrough took the world by storm. Now Sally Hansen introduces trendsetting prints exclusively for the holidays, putting the spirit of the season at your fingertips. 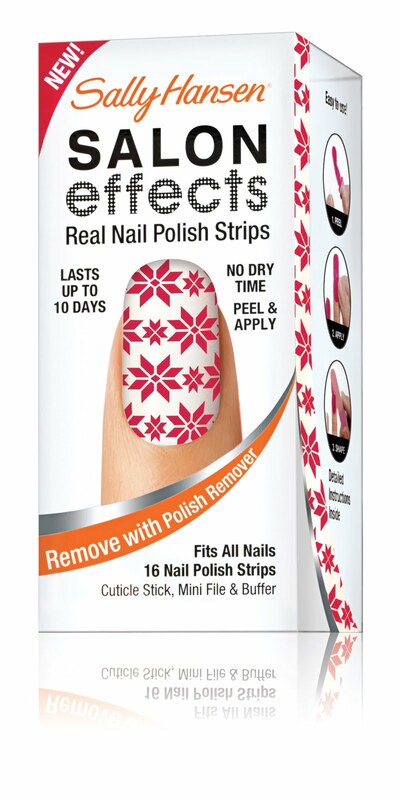 Like all the prints in the Salon Effects Real Nail Polish Strips collection, the five festive prints let you peel, apply, file, and go, delivering a real-polish manicure without mess or stress. Whether you’re playing Santa and stuffing a stocking or heading to the party of the moment, these seasonal strips are the ultimate accessory. 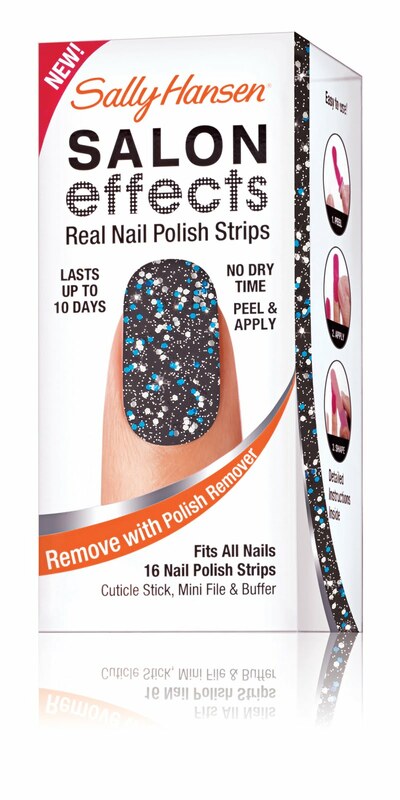 and Winter Funderland (black, silver and blue glitter). I like Snow Bunny the best. Any word on when these should hit store shelves? I'm super excited about the plaid and argyle! I saw those this weekend. I LOVE THEM. Winter Funderland was already sold out. Plaid About You is EVERYTHING. I wish they had elves!! =( I was really looking forward to maybe christmas trees, strings of lights, actual snow men. You're right the halloween ones were way cuter! I still haven't tried any of the Salon Effects, but their designs (including these new ones) always look fun. Yeah, I totally agree with Jackie Giardina - it would've been perfect if they had a string of lights. Thanks for giving us the heads up, Scrangie! sooo cute. i wish these worked for me, but i tried and failed. ooh the last one looks pretty! Sorry, but I don't really like those stickers. is Winter Funderland. Peppermint Twist is also very cute for the holidays I think :) I wish they can come in 20 nail polish strips.. why 16????? I just love plaid! These are all fantastic looking. The only one I really like is Winter Funderland, which I will definitely be buying but the others for me are a pass. I really like the candy stripe and red and black plaid, but I too think they could have gone more fun and whimsical. Silver snowflakes on a blue background, or candycanes and bows, or strings of lights... argyle? What's so seasonal about argyle?? As for why 16 and not 20? Easy. So that you can only easily get one wear out of a pack, but still have some fit choices. These are already at my walgreens, I saw them yesterday! I really like the glitter one, I didnt get any though.